Ottilie Colter and the Narroway Hunt is one of the six books shortlisted for this year’s Readings Children’s Book Prize. Here’s everything you need to know about this thrilling high-stakes fantasy. When Ottilie’s younger brother is taken by the Pickers, she disguises herself as a boy to rescue him. She soon finds herself at an elite training school for hunters, in the mysterious in-between world of the Narroway – a dangerous place that doesn’t appear on any maps and is overrun with terrifying creatures called dredretches. Not only does Ottilie face great peril, she also risks being found out to be a girl in this highly gendered, segregated world, where girls are confined to servant roles. Ottilie soon realises she has far more to fight for – and against – in this twisted, shadowy world of conspiracy, political intrigue and discrimination. This fresh fantasy with high stakes introduces a rain-soaked, squelchy world to explore and a complex web of mysteries to be unravelled. Book two of this action-packed fantasy trilogy, Ottilie Colter and the Master of Monsters, is available now. 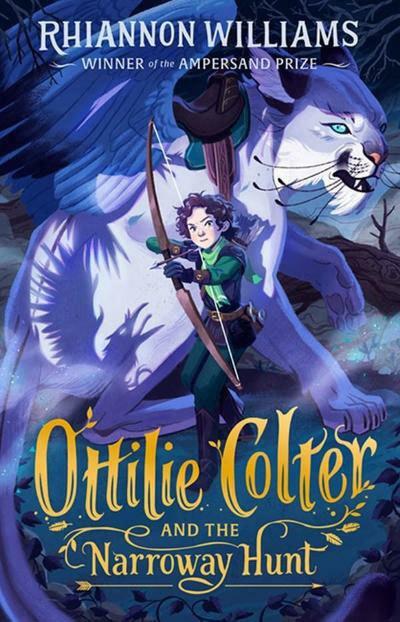 Young readers who love brave heroes, secret orders and undercover infiltration, danger and derring-do, and unique eldritch monsters will lap up Otillie’s adventures. For ages 9 and up. Originally from Taradale, Victoria, Rhiannon Williams now lives and writes in Sydney, sharing an apartment with two friends and the ghost of a cat. She studied English and history at the University of Sydney, and completed a Bachelor of Creative Arts Honours at Flinders University. Rhiannon has a background in theatre and hopes to tell stories until the end of her days. The winner of the 2019 Readings Children’s Book Prize will be announced next week, on Tuesday 16 April. Read more about the Readings Children’s Book Prize 2019 shortlist here.